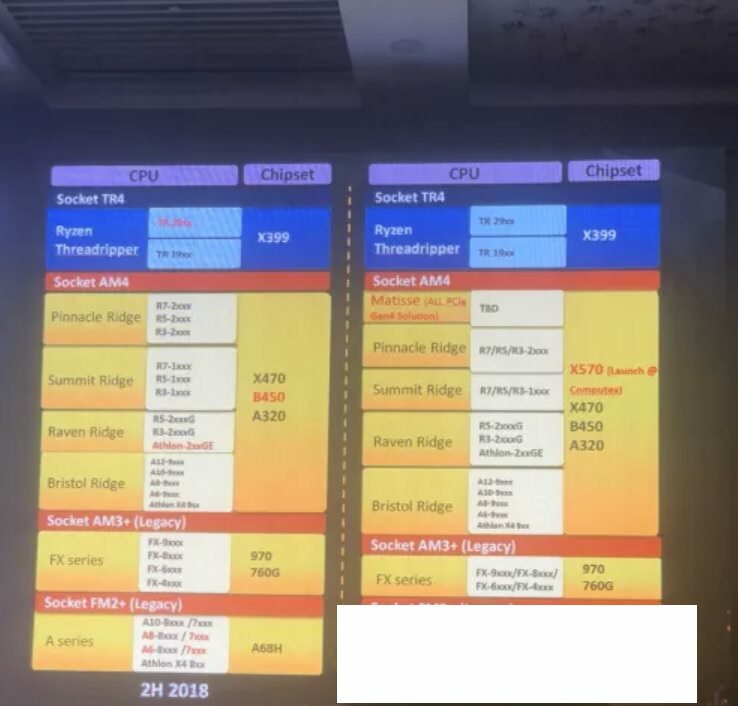 Traditionally, AMD has launched their Ryzen series of mainstream products in April – but that looks set to change given a recent leak, which hints that the X570 platform is targeting a release of Computex 2019, which takes place between May 28th and June 1st. The slide has emerged from Gamer.com.tw, and is being reported to have been taken during a Gigabyte event. In the slide, Matisse (which is the codename for the Ryzen 3000 series of processors) is going to have a brand new platform, the unsurprisingly named X570 (so we can presume there’ll be the B550 and other PCHs released in the future too). 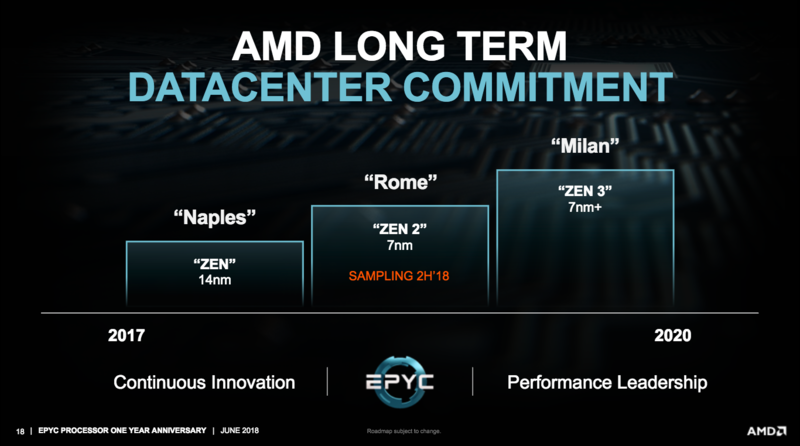 The AMD X570 is also confirmed to support PCIE 4.0, which should double transfer speeds across the PCIE bus (although it’s unconfirmed if the actual number of PCIE lanes will see an increase too, given Rome / Epyc 2 isn’t, there’s a good chance AMD will not increase the number for AM4). The big question left is what features are you going to miss out if you decide to drop in a Ryzen 3000 series CPU into an X400 series motherboard (assuming that even works, as it’s not been 100 percent confirmed, but it does seem rather likely). The clear loss would be PCIE 4.0, but other possibilities include more limited overclocking support due to possible power delivery, no support for increased processor core counts and so on – but this is all speculation. Given AMD are planning to launch the motherboards at Computex, there’s always the possibility the CPUs could launch at an earlier date, but it’s likely (in my opinion) that we’ll see a simultaneous CPU and X570 launch, as it would allow AMD to have bragging rights to being first to the market with such a combo (unless Intel somehow pip them to the post). Given the time slot we’re looking at here, it’s possible that AMD could have NAVI ready for Computex too -as they were apparently aiming for a Q1 / Q2 release, and given Vega 7nm supports PCIE 4.0, Navi supporting it for the mainstream isn’t a big deal. There are a series of major architecture changes for the Zen 2 architecture, and given improvements for IPC, AVX performance bumps, clock speed improvements, and all the other general architecture changes, with any luck it’ll help AMD be better at pushing the minimum frame rates up for games (Ryzen does still struggle with minimum frame rates compared to Intel on some titles, for example, CSGO). With that said – for ‘most’ titles, using a graphics card such as Nvidia’s GeForce RTX 2070, there’s not that much difference as resolutions increase between a Ryzen 7 2700X and an Intel I9-9900K. Either way, it’s likely performance and benchmark leaks will start popping up over the next couple of months that will give us better insight into what exactly these chips will be capable of. This article was filed under Features, Hardware. Tagged with amd x570, amd zen, ryzen, ryzen 3000 series, x570, zen 2, zen 2 release date.